See how the savings can add up! Start making time work for you today! per card each pay period. Automating your time & attendance systems will reduce that to one minute. 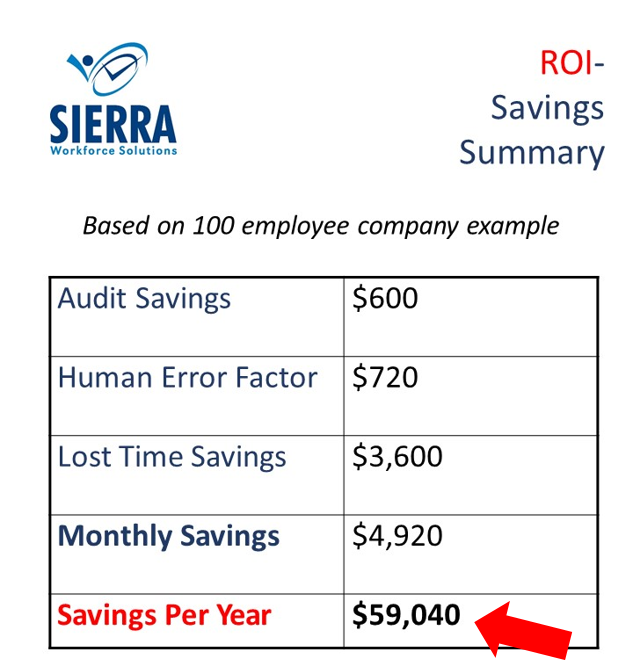 Lost time or employee “time theft” savings consists of wages recaptured by the time & attendance system’s rounding and restriction capabilities. The average weekly workplace time “theft” is four hours and five minutes. This includes long lunches, breaks, tardiness, early departures, etc. according to studies conducted by the Robert Half Agencies. Studies have shown inaccuracy in calculation of employee time to be from one percent to eight percent. In our calculations we assume .25%. Want to see how much your company can benefit by automating your time & attendance? Call or email us! We’ll put together a worksheet just for you.